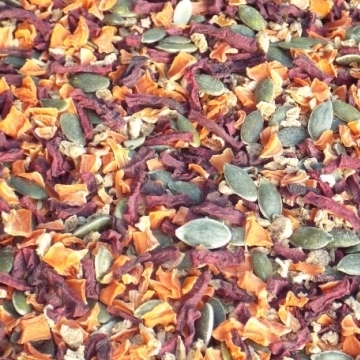 A delicious & healthy blend of Carrot flakes, Beetroot slices, Pumpkin seeds, Soya mince. Enjoyed by Parrots, Parakeets, cockatiels, Lovebirds and Budgie. Can be eaten dried or soaked for a short time in cold water to offer as a wet food. 10 reviews available (showing latest 6 below). My guys love vegetable crunch so I sprinkle a bit of this in their food a few times a week as a ttreat which they enjoy very much. Bought this as a treat for my cockatiel Dempsey as she is loving it, she particularly likes the beetroot. I’ve tasted it myself and it’s really nice, had to stop myself from eating more! Tidy mix for all my birds now. I'd recommend this Vegetable Crunch. Smells good and it's great to add to the TidyMix Seed if your birds are stuck only on one vegetable (broccoli), so it's gives your birds that bit of something extra. Handy to have.